Kanye West is already spoiling his baby mama. Kim Kardashian recently took to Instagram to proudly show off her new gold Cartier bracelets, courtesy of her rapper beau. "The Don strikes again!!! #SoLucky!!!!!!" she wrote, displaying a wrist full of splashy Cartier bracelets. The five different gold Cartier bracelets are said to include the Cartier Panthere Bracelet embedded with diamonds, a yellow gold Cartier Love Bracelet with diamonds (worth $9,400) and the Cartier Juste un Clou, which alone retails for $34,650. Add two other animal print bracelets, and the total roughly adds up to a whopping $65,000. Pic: Kim K's $6,000 Shoes?! But what do you think? 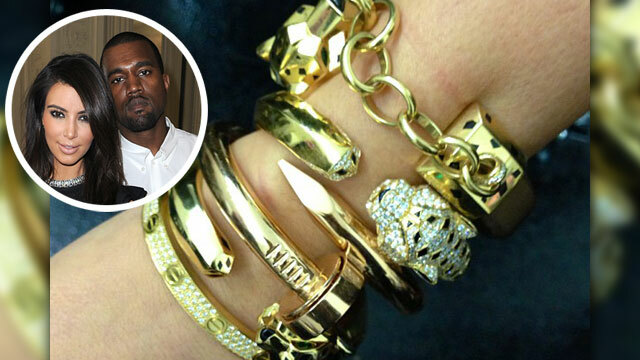 Are these pricey bracelets enviably flashy, or downright trashy? © 2013 CBS Studios Inc. All Rights Reserved.